Vineyard by Redstone Villas is located in Nashik, the hub for some of the best wines that the country produces. This property boasts of a breathtaking lake view and a grape farm too (homemade wine for the win maybe?). 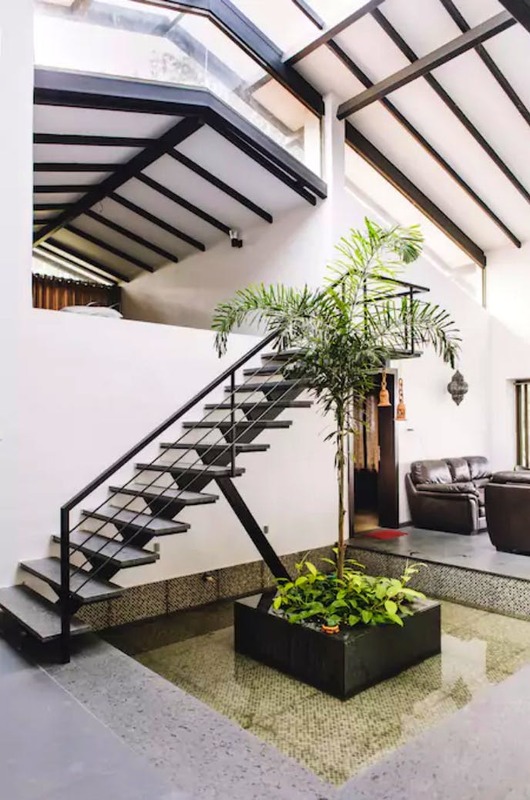 Vineyard, a 4BHK property by Redstone Villas is a small yet lavish house that has large spaces enough to easily accommodate upto 20 people at any given point of time. Everything on the property is designed in a very personal manner- just how a holiday home should be and feel like. The rooms are all very spacious and the large windows facilitate maximum daylight pouring into the house while it gives you access to a scenic outside too (it's a win-win, isn't it? ).The stairs that lead to the first floor opens into a giant space that is best suited to sit and chill in from where you can take in the beautiful scenery (we loved it). As much as you'd want to cook your own meals, the kitchen isn't accessible to guests, so just chill and order in some food for the soul. The best part? The pool by which you can sit and take in nature while you sip on your favourite drink (even if it isn't wine) and enjoy the company of a good book or your family and friends. Sula and Soma vineyards are not too far away from here, so don't forget to head there while you're on your holiday. P.S.-The owner is extremely helpful, so should you face any difficulty, he is just one phone call away.